If you are having knee pain while your squat or run, the issue may not be just your aching knees. The knees are affected by the joints above and below them. In case of the knees, this means the hip joint and the ankle joint. We will look at the hips another day, so today let’s talk about the ankle. The ankle is comprised of the tibia, fibula, calcaneus, and the talus. These bones along with the muscles, ligaments, and tendons associated with them make up the ankle joint and provide us the ability to run, jump, and walk. 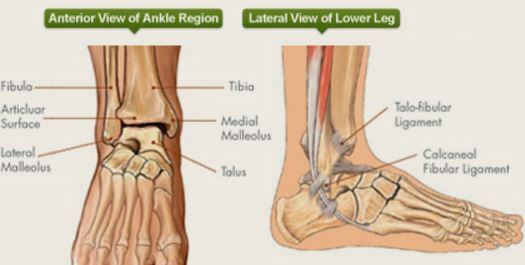 Over time, the ankle can become tight, immobile, and painful. As a result, this causes a domino effect along the kinetic chain which can lead to knee and/or hip pain, and possible even back pain. What causes the tightness? Running, cycling, or any activity in which there is a constant repetitive stress placed upon the ankle, especially when the ankle is not allowed to move through it’s full range of motion or it can’t due to a lack of flexibility of the surrounding muscles, or lack of mobility in the ankle joint itself. Muscular imbalances between the muscles in the back of the lower leg (calves, soleus, etc. ), and the front of the leg (shine muscles – anterior tibialis) will also play a role as well. Bottom of Foot – find tender spot and hold as long as needed to reduce tenderness. Flexibility: 10-12 times per leg, hold each stretch for a slow count of 2-3. Try the program out and let us know what you think! Leave a comment below. Like what you have seen? Subscribe to our blog so you can stay updated on all of our latest blogposts!